For decades, World Vision has partnered with the United States Agency for International Development (USAID) to implement lifesaving development projects around the world. In this blog series, we’re looking at the success stories of USAID’s 2018 report, Acting on the Call, which describes the amazing progress in child survival in just the last few years. Read the introduction to the series here. Shanta Das has been working as a paramedic in Bangladesh for 16 years and has performed over 7,000 deliveries. “When I was young, my mother used to tell me a story about giving birth to her first child,” said Shanta, now a mother of two children herself. Because there was no hospital nearby, Shanta’s mother suffered at home from labor pains for four full days, until ultimately, the child died. “If he survived, I would have had an older brother now,” said Shanta. 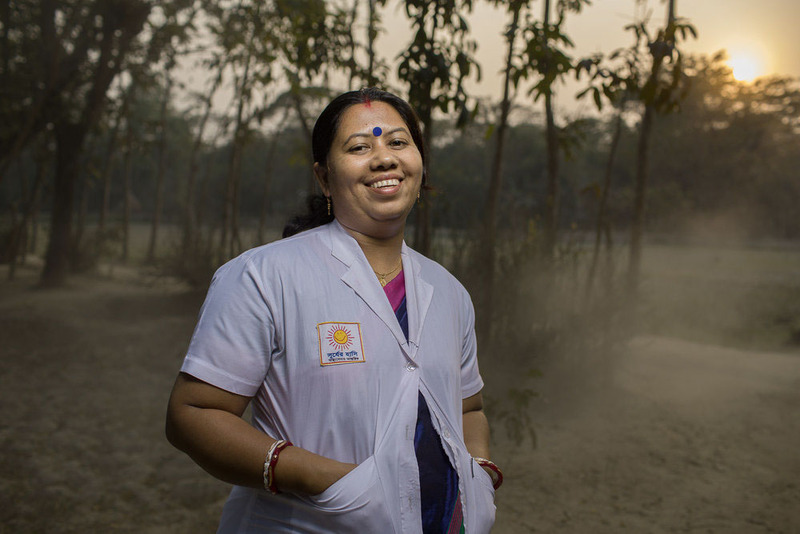 “I don’t want anybody to lose her child – so I decided to become a paramedic.” Shanta works at a health clinic in Chittagong known as Surjer Hashi (in English, “Smiling Sun”) and travels around the region to visit pregnant women and new mothers. The USAID-supported Surjer Hashi network of 399 clinics provides essential health services to over 26 million Bangladeshis, or about 16 percent of the population, with a focus on reaching poor and hard-to-reach communities. In the last five years alone, USAID has helped the Surjer Hashi network avert 2,000 maternal deaths, 10,000 child deaths, and avoid 1.9 million unwanted pregnancies. After 20 years of support from USAID to develop the network and operate the clinics, USAID is supporting the development of a sustainable financial and management system so that the network of clinics has the capacity to operate on its own, without relying on USAID financing. Under a newly created private social enterprise, the Surjer Hashi network of clinics will gradually reduce financial dependence on USAID and eventually become an independently operated and sustained network. The Government of Bangladesh views the Surjer Hashi Network as critical to achieving full access to health services by the population. Surjer Hashi clinics across Bangladesh are already strategically placed to complement public health facilities, based on input from the Government of Bangladesh. In rural areas, Surjer Hashi satellite clinics and community outreach initiatives help reach populations that the Government of Bangladesh has designated as hard-to-reach due to resource and personnel constraints, high population concentrations and/or geographical challenges. Similarly, in densely populated urban settings, Surjer Hashi clinics are organized to complement and fill gaps in existing services. USAID helps develop efficient and effective models for providing health services with adequate cost recovery to enable sustainability, while maintaining their focus on poor populations. Currently, clients at the clinics pay for services on a sliding scale depending on their income. USAID will also assist the newly established Surjer Hashi network to set clear standards and strategies for clinic management, service delivery, and pricing/purchasing across the country. With USAID support, the Surjer Hashi clinic network will explore new and alternative financing options, including with private companies and the Government of Bangladesh. This will help ensure financial sustainability while continuing to provide low-cost services for poor clients. These changes will enable the Surjer Hashi Network to operate more efficiently and sustainably while expanding, enhancing and modernizing services. USAID’s partnership with the Government of Bangladesh has enabled them to provide equitable access to services across their population. By providing the tools to make the Surjer Hashi Network of clinics financially independent and sustainable, USAID is partnering with the Government and improving population coverage and equity to support Bangladesh on their development journey. Photo: Shanta Das, 34, is a paramedic at Smiling Sun Clinic in Chittagong, Bangladesh. She completed a three-year midwifery training. She also received additional trainings on mother and childcare from USAID. Now, she provides health services to children and mothers as a paramedic. During the last 16 years, she has performed over 7,000 deliveries. Credit: Morgana Wingard/USAID. ← Do you have something to say?